D. Gregory La Cava. With William Powell, Carole Lombard, Gail Patrick, Eugene Pallette, Alice Brady, Alan Mowbray. The movie industry in the 30’s had to tap into all sorts of fears and hopes to earn their 15 cent admission fee. And they succeeded—60 to 70 million Americans patronized the theater each week, watching the musicals and westerns and gangster films and escaping the difficulties of their lives. Almost 25% of the country was unemployed in 1933; by 1936 that had gone down to about 17%, but not until 1942 was that percentage back down to pre-Crash rates. And then, well, the country had other problems. To put that in perspective, the unemployment rate lately has been hovering at about 8-9%. Of course, percentages can be tricky—keep in mind that the overall population of the United States is quite a bit higher than it was in 1930. 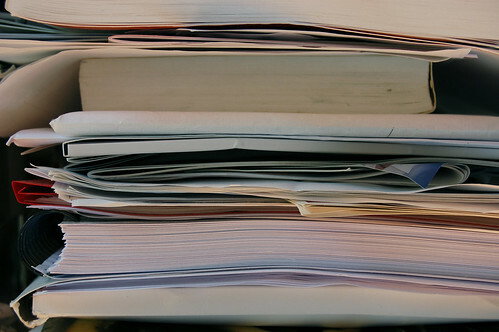 If you’re interested in actually breaking down the numbers, there are hundreds—thousands—of sites that will help you do that. Come back and tell us what you find out. Also the racial and gendered composition of the workforce has changed, our conception of the nuclear family has changed, as have assumptions about receiving help from the government, the price of food, our ideas about the line between “need” and “want”, our relationship with credit…Lots of things have changed. That wasn’t actually my point. Anyway. 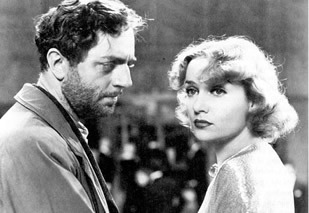 My Man Godfrey is set in New York city, in the middle of the Great Depression. While many of the other movies of the era focus only on the glittering side of financial dreams, this movie shows both sides of the economic divide. The movie begins in a shanty-town at the city dump, where a scruffy homeless man (William Powell) is smoking a pipe outside of a cardboard shack. A shiny black automobile pulls up to the edge of the dump with a screech, with another automobile in close pursuit. The wealthy have descended upon the dump to find a “forgotten man” for their ongoing scavenger hunt. The homeless man—Godfrey Smith, as we will soon know him to be—initially refuses their rudely-put request, but then agrees to accompany one of the women, Irene Bullock (Carole Lombard), who stays behind to apologize for the others’ rudeness . They go to the Waldorf-Ritz, where Godfrey eloquently calls the room of very wealthy people a bunch of empty-headed nitwits and says he’s ready to return to the company of really important people. Irene is thrilled with his bravery—and with the fact that he helped her to beat Cornelia, her awful sister, for the first time in her life. She asks him if there is anything she can do for him, and he asks for a job. Irene offers him the job of family butler, which he gratefully accepts. The family is nuts: Mother Butler always wakes with a hangover and sees pixies. The rest of the time she giggles. Incessantly. Cornelia is pretty much a stone cold beyotch, glaring and posturing so beautifully that I wish I were more familiar with the rest of her movies. She should have been a comic book villainess—she is a gorgeous, though not green, Maleficent. Irene is the consummate dizzy dame with a heart of gold, fluttering and screaming and having spells, but so much more empathetic than the rest of the family that she almost seems normal by comparison. Mr. Butler is by turns resigned, confused, frustrated, and furious by the women-folk in his life, and their ever-increasing monthly expenditures. 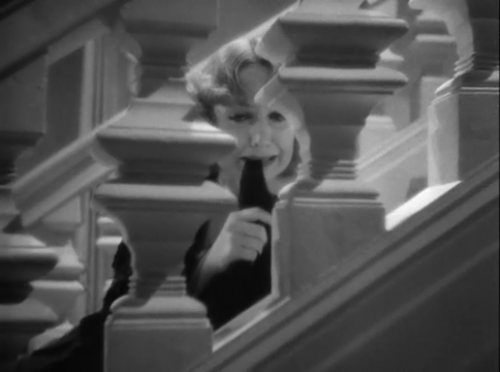 Godfrey manages the household beautifully, mixing hangover cures for Mother and dealing with Cornelia’s petty sniping, until Irene decides she is in love with him, a fact which increases his difficulties a bit, as he singlehandedly has to keep the “certain proprieties” in place. The next day it is revealed that Godfrey Smith, late of the City Dump and now buttling for the Bullocks, is actually Godfrey Parke, of the Parkes of Boston, whose family is just as wealthy (and disconnected from reality) as the Bullocks. Sickened with his life after an affair went wrong, Godfrey ended up at the East River, planning to “slide in and get it over with.” Instead, he met the men clinging to the lowest ring of society, and clinging hard, and decided to become Godfrey Smith and battle it out without his birth-right advantages. Of course, the Bullocks know nothing of any of this, and his family is to remain uninformed. Finally, Godfrey loses his temper at the latest in a long line of Irene’s antics. In the middle of an impressive display of theatrics, she slumps against him, apparently out cold. Godfrey isn’t completely sure if she’s faking or not, so he carries her up to her room. As he’s rummaging through the trinkets and bottles on her dresser, looking for the smelling salts, he glances up and catches her watching him in the mirror. She immediately falls back, still pretending. He picks her up again and puts her in the shower. Rather than being furious, she screeches that this rare show of emotion means that deep down he loves her. He looks shocked and leaves the room immediately. She’s ecstatic. She jumps on the bed a bit. That’s not a metaphor. Downstairs more drama is afoot: Mr. Bullock has come home early and called the family together for a talk. He’s lost the money, stocks are gone, and he’s played with the investors’ money to try to regain the capital. All in all, a bad show. The good Bullock name is done for…until Godfrey reveals that he knew of the financial trouble and has used his business acumen to play the market and rebuy all of the lost stock, which he then signs over the Mr. Bullock. Godfrey saves the day, but resigns as butler. 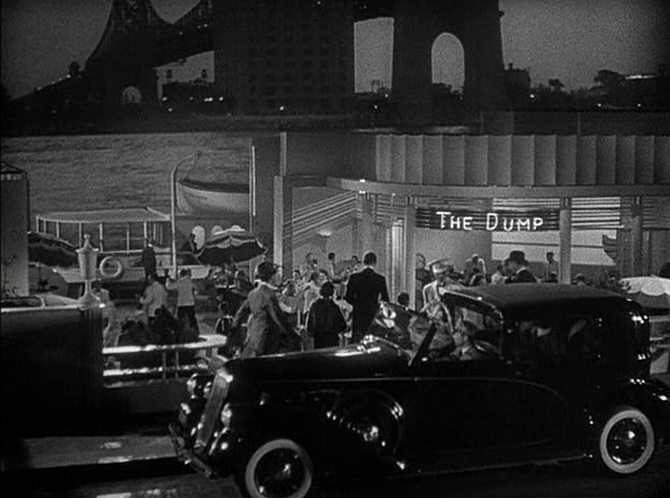 Godfrey has kept a bit of the profits to fund a private project of his own—where the city dump used to house dozens of unemployed men, a swanky new club now glitters, appropriately called The Dump. The doormen, parking valets and the waiters are all familiar faces: Godfrey has staffed his restaurant with the men who couldn’t find work. The wealthy investors in the club won’t be getting dividends for a while—first he’s got housing and heat to provide for the fifty employees, and then there are plenty more to help after that. Unaware of the truth about Godfrey’s finances, Irene follows him to the dump, bringing firewood and baskets of food to make the cardboard shack she expects to make home as comfortable as possible. Instead, she finds a swanky club packed with the highest members of New York society. She is not deterred. Obviously. She grabs an old family lawyer from the dining room and beards the lion in his den. Or rather, Godfrey in his office. And they all—Irene, Godfrey, Bullock family, forgotten men, Dump investors—lived happily ever after. The movie is absolutely wonderful. The characters are all engaging, there isn’t an off performance in the whole thing. Even the bit parts are played by fantastic actors. The love story sounds perhaps a little abrupt here, but it’s actually really well done. If you watch the way Godfrey watches Irene and Irene watches Godfrey—even in the beginning, when he’s grimy forgotten man and she’s a ridiculously flighty and spoiled little girl —it’s completely believable. (William Powell and Carole Lombard were married and divorced before this movie was made–he was responsible for her involvement with the project. They work very well together.) Watching the relationship between the two of them develop is fascinating. The power in the relationship shifts constantly–from the initial dynamic of Irene’s wealth and Godfrey’s position as servant it reorients as Godfrey sets boundaries and makes Irene abide by them and then shifts again as Irene manipulates circumstances to prove his attention and force Godfrey’s emotional response to her foolishness. If you picture power as a rubber ball, they pass it off to each other constantly through the movie. Which I absolutely love–it’s not a perfect picture of an equal relationship, but at least they each have power. I could talk about gender and power relations all day–in fact, some days I do. But rather than focusing solely on the feministy stuff, this time watching the movie I concentrated on the social commentary. While the film is screwball humor at its best, it is grounded and framed by the reality of poverty. The opening screen shots, which you can see above, are absolutely beautiful. But more than strictly providing a wow beginning, they grab the audience’s view with the glamour and glitz of high-society (big marquees, tall buildings, lights flashing on the river), and in a circular panning shot, end seamlessly… in the city dump. The focus of the movie returns incessantly to the have-nots–even when apparently firmly grounded in the world of the haves, there is always an undercurrent of threat in the possibility of slipping back to the the world of the dump. Mr. Bullock ask why Godfrey stays, when the family is so frequently infuriating; Godfrey replies that it is better than the dump. Mr. Bullock loses his share-holders’ money and says he is going to end up in the dump—or jail. Godfrey takes his rich Harvard friend to the dump, to illustrate where his new persona was born and to introduce his emerging ideas about the club. Most of the characters in the movie are wealthy beyond comprehension, but their security is not complete—everything is a little unsettled and unsettling because of the thrumming back-beat of poverty. Hand in hand with that emphasis on poverty is the idea that not all the currently poor have always been poor. From Godfrey’s chosen residence in the dump, to Mr. Bullock’s near-miss, to the bank manager of the Second National Bank—who gave his considerable fortune to his investors when the bank crashed, and so was left penniless—the poor aren’t poor because of any personal failing, but rather because, well, most people are. When you consider how stigmatized poverty is—all of those ridiculous Puritan values (pulling one up by one’s bootstraps and so on) are kind of turned on their pointy little heads. Replacing that idea of wealth as a measure of personal merit is the idea that all of us– rich, poor, intelligent, foolish, giddy and sad– have obligation and responsibility to those around us. The theme of responsibility plays throughout the movie: Irene wants to do something for Godfrey because he helped her beat Cornelia. Godfrey wants to help the men at the dump because they showed him the value of life. The manager of the Second National Bank felt responsible for to his investors. Godfrey wants to help the Bullock family because they gave him a home. And then, since Godfrey helps the men at the dump, they are able to help others. And so on and so on. Even the movie’s theme, which winds its way through many scenes in the movie, echoes the tune of “Brother, Can You Spare a Dime,” a classic of the Great Depression in which the singer attempts to remind the apparently wealthy listener of his obligation to help the needy. While the romance is wonderful, and the comedy is incredibly well-done, the social commentary that provides the underpinning of the movie makes it absolutely unforgettable.